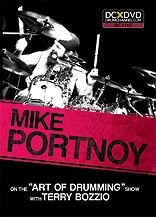 Mike Portnoy: on the “Art of Drumming” Show with Terry Bozzio DVD – Mike Portnoy on the “Art of Drumming” Show with Terry Bozzio brings together two of the most acclaimed drummers ever for a candid conversation and an improvised performance that turns into an incredibly musical, entertaining, and educational event. Mike Portnoy has 24 Modern Drummer Magazine Readers Poll Awards, including: 2004 Hall of Fame inductee, Best Progressive Rock Drummer (12 years in a row), Best Clinician (twice), and Best Recorded Performance of the Year (six times) for many of his albums with Dream Theater. Run time: 80 minutes. **Please note: Opened media is non-returnable.